5:20pm Bedroom – Frank asks Tiffany doesn’t see it coming, do she? Michelle says no she’s been cleaning. Frank says this morning I walked around the corner and smiled at her and she turned around and kept cleaning. I’ve tried to be nice and get her to open up to me but she just won’t. She doesn’t sit down and bug me like she bugs ya’ll. Gosh if Natalie goes home next week Natalie is going to be sh*tting bricks. 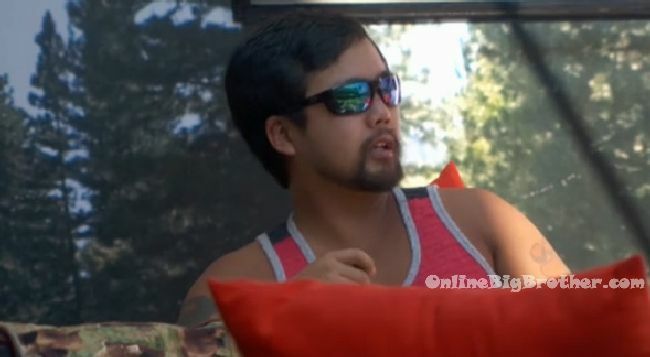 James is going over his conversation with Tiffany where he said she has 4 votes. James – even if we flipped nobody would know we flipped… honestly Frank wouldn’t know who did it..
12am – 12:40am Bedroom – James, Bronte and Natalie are talking. Natalie and Bronte both say they don’t even want to be friends with Jozea and Victor. Natalie says if I see them I will… turn my back to them. 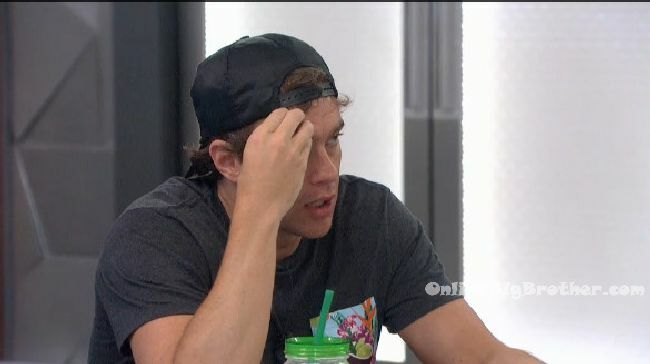 James asks Natalie if she went to the open casting call or if she submitted a video. Natalie says neither. I was recruited. 5:25pm In the bathroom – Davonne and Tiffany are talking. DaVonne says maybe the 5 doesn’t exist any more. They do the same to me. That’s why its important to mix and mingle. Tiffany says I know right now I’m fine but.. Davonne says not to sound cliche but “friendship”. Tiffany says Nicole never wants to talk personal. DaVonne says maybe we just linked up with the wrong people. 12:20am – 12:55am Kitchen – Zakiyah says I know a guy that’s number is over 70. Natalie says I want a guy that’s been with less than 10 girls. James says yes! Paul says he’s been with 8. James asks Natalie how many guys she’s been with? Natalie says 1 doesn’t count .. I want to erase from my memory. Paul says it still counts. Natalie says he cheated on me so I don’t want to count him. 6:40pm James and Michelle are talking. James tells her that Frank is wanting to take her out. Michelle says I don’t get why? James says I think because he thinks you run your mouth. Michelle says but that would be good for his game .. easier to beat. Maybe he is telling you one thing and the group another thing. He needs to go! He said Day and then me next. 2pm Frank is alone in the kitchen eating and talking to the cameras. Frank says Mom, Nana, I miss ya’ll. I hope I’m not embarrassing anybody. Mom I hope I’ve been cussing less and less. I feel like I’ve been doing a little bit better but I’ll continue to work on it for you. I hope I’m not being too harsh on people but its kind of fun .. maybe I’m a jerk. But it’s kind of fun some times. 10:20am Big Brother wakes up the house guests. James tells Corey that Paulie’s idea was to get Frank to throw the HOH to get you (Corey) or Paulie out. 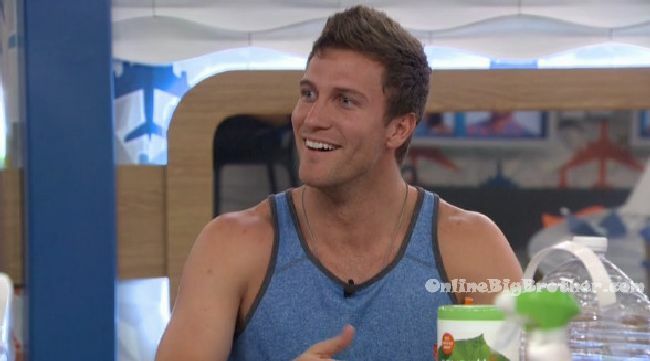 He (Frank) was like yeah I’m down with it, throw Corey and Paulie up together. Corey asks so does he think Nicole is going to throw the HOH. James says I don’t know. Corey asks do I tell Frank I’m throwing it? Like whats the full plan? James says we’re trying to make Frank feel comfortable. They count the votes… it’ll be 9 to 0 Tiffany evicted. Frank saying they are looking strong going into next week.. They might have to “Beast it out” .